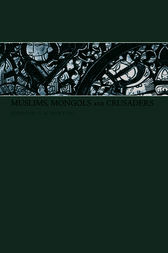 The period from about 1100 to 1350 in the Middle East was marked by continued interaction between the local Muslim rulers and two groups of non-Muslim invaders: the Frankish crusaders from Western Europe and the Mongols from northeastern Asia. In deflecting the threat those invaders presented, a major role was played by the Mamluk state which arose in Egypt and Syria in 1250. The Bulletin of the School of Oriental and African Studies has, from 1917 onwards, published several articles pertaining to the history of this period by leading historians of the region, and this volume reprints some of the most important and interesting of them for the convenience of students and scholars. Gerald R. Hawting is Head of the History Department and Professor in the History of the Near and Middle East at the School of Oriental and African Studies, University of London. His special interest and most of his publications relate to the early development of Islam in the Middle East.